Access the job board to post jobs, find posting data, and review resumes/curriculum vitae. Note: you must have a job board log-in to access these pages. Please contact support@hercjobs.org or your campus representative to find out if you are eligible. HERC job board visitors are incredibly diverse and well trained. They come from all walks of life and career stages, but share a common interest in careers in higher education. HERC's annual diversity outreach campaign helps your institution demonstrate good faith affirmative action efforts, including outreach, should your institution be audited by the Office of Federal Contract Compliance Programs (OFCCP). HERC amplifies our members' outreach through extensive in-person outreach and advertising campaigns. Our job seeker-focused site, HERCJobs.org, hosts over 100,000 registered job seekers. HERC is onsite and in person representing your jobs and institutions at job fairs, professional meetings, graduate student conferences, and networking events. Here, we encourage diverse job seekers to explore careers in higher education. For those already in the academy looking for faculty positions and mid/high-level administrative positions, this direct interaction is an opportunity to talk about your institutions, programs, and career opportunities. In 2018-19, we are exploring ways to further enrich the conference experience by leading professional development seminars or sessions. 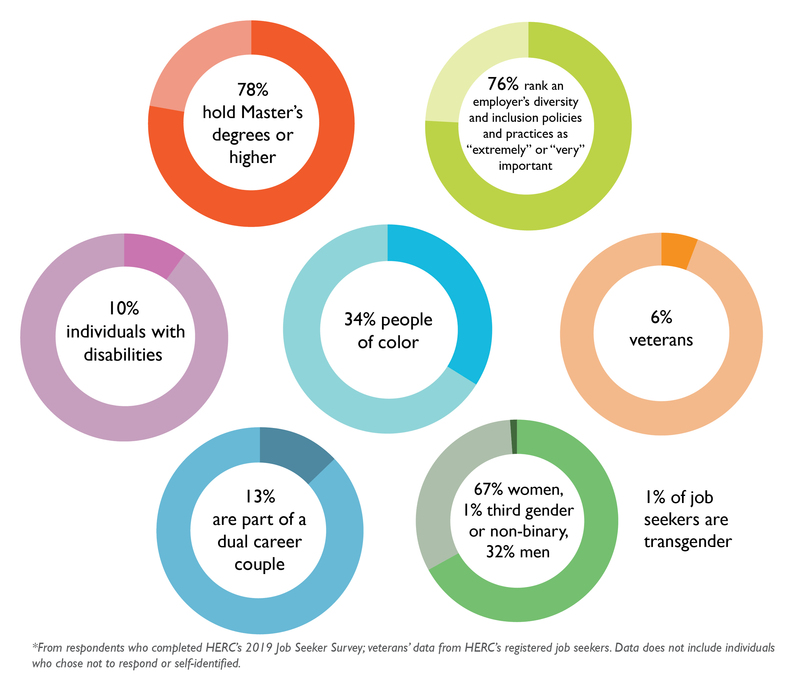 In addition to general and disciplinary advertising, HERC's advertising targets veterans, professionals with disabilities, racial and ethnic minority groups, and women. The allocated value of HERC's 2018-2019 digital and print ad campaigns, as well as our partnerships with organizations representing diverse job seekers, is $118,490.